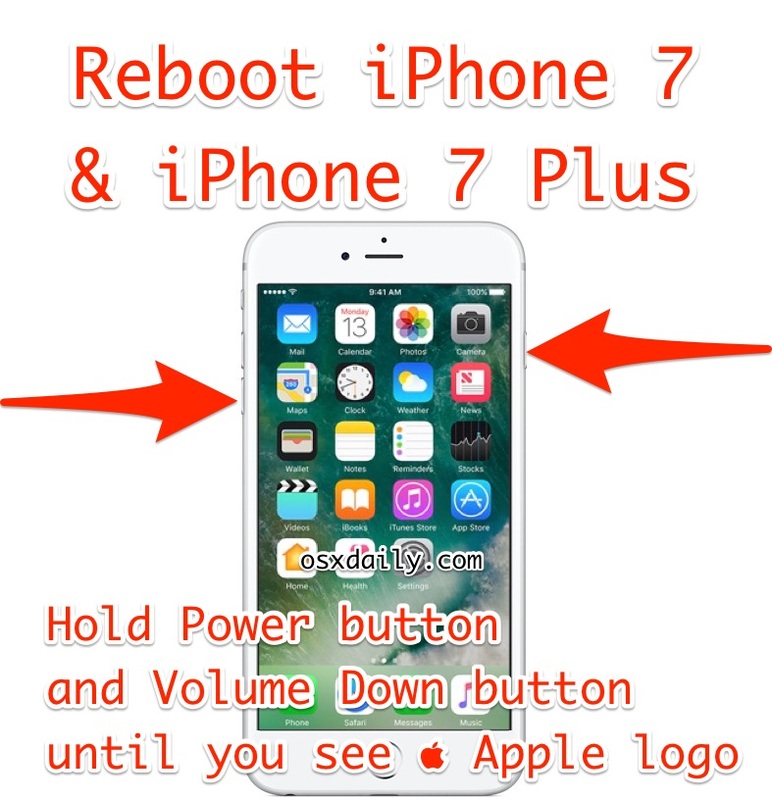 If you are an iPhone 7 owner, you may be wondering how to restart an iPhone 7 or iPhone 7 Plus given that it does not have a clickable Home button. It turns out that iPhone 7 models do not need the pushable Home button to forcibly restart the device, because they instead rely on the volume buttons. Let’s review how to restart an iPhone 7 and iPhone 7 Plus. It may be a little unusual at first if you’re accustomed to the old way of force rebooting other iOS devices with a clickable Home button, but it’s just as easy despite being a bit different. A forced restart is not the traditional restart procedure of shutting down and starting back up. A forced restart is typically necessary when a device has frozen or crashed or is otherwise unresponsive. Some people erroneously call is a force reset or hard reset or an iPhone reset, but resetting a device actually resets it to factory settings which is not at all what a forced restart or forced reboot does. 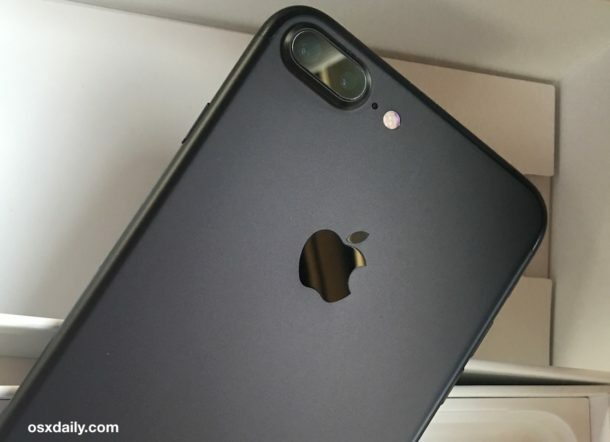 The Power button is located on the right side of the iPhone 7 device looking straight on to the glass face. The Volume Down button is located on the left side of the iPhone 7 if you’re looking at the glass screen face. All you need to do is hold both Volume Down and Power concurrently to start the force restart process on iPhone 7 and iPhone 7 Plus. Continue holding down both the Volume Down and Power buttons on iPhone 7 until you see the Apple  logo appear on the screen. Once the Apple logo appears on the display you can stop holding the buttons, the iPhone 7 has successfully been restarted. 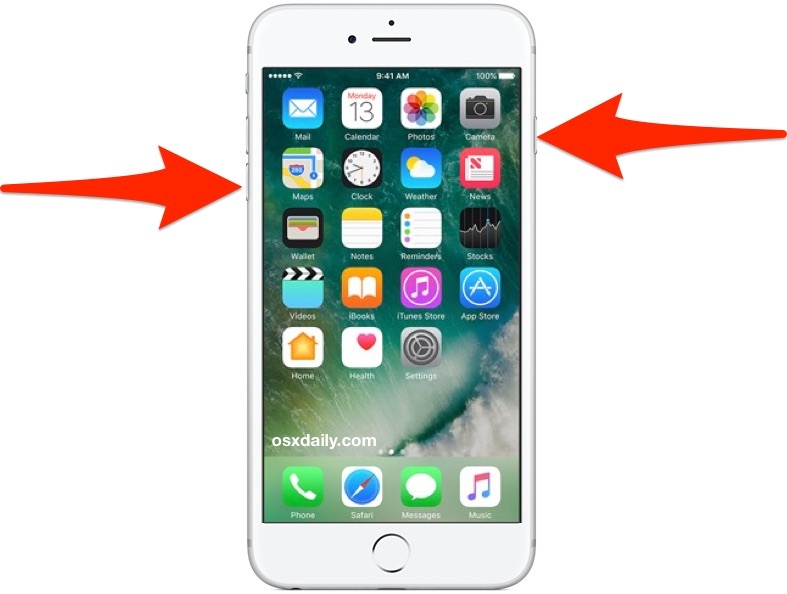 The key thing to remember is that with restarting iPhone 7 and iPhone 7 Plus (and likely restarting future iPad and iPhone models too, which are sure to do away with the traditional home button…) is that rather than holding the Home button, which is no longer clickable, you hold down the Volume Down button instead, which remains clickable. The power button usage remains the same. It’s different, but once you reboot an iPhone 7 this way a few times you’ll learn the new habit. You’ll almost certainly want to memorize it too, because the iPhone is usually on the forefront of changes made to the Apple product line up, which suggests that all future iPhone and iPad hardware without a typical clicking home button will have the same mechanism to reboot those devices. And yes for a simple restart of iPhone 7, you can still shut down the iPhone 7 and iPhone 7 Plus and then boot it back up again as usual. That’s one more feature copied from Android phones. Those are also restarted exactly like that: by holding power and volume down together. Restarting a device is not a feature. How works “printscreen” on iPhone7 /7 plus? That also required both Home and Power buttons. The screenshot feature remains the same as before, but it is a little finicky until you get used to it with the new Home button. Home button + Power button captures on the iPhone 7. I’ll probably review this in an article because I’ve seen a lot of people having issues with it. @Luis: How many options do you have with a total of three buttons…? You could also say that all electric devices with a power button have copied the feature from all other electric devices with a power button, since they are all using a button to switch the device on and off! Why don’t they think of their own idea on how to switch on and off the device?? …That’s the dumbest thing I’ve ever heard! Vol up & vol down. You get the idea. There are loads of combos. How would you use the ring/silent switch as a regular button? I’ve had 2 iPhone 7s because a little loading circle comes up the screen no matter what I’m doing and then comes back on. It’s now done it on my iPhone 7 plus can someone advise me on this? Don’t put your iPhone 7 Plus in water, for starters. thank you so much !!! I tried everything and nothing worked but this did ! thank you !! Go through the onscreen setup process when it says “Hello” in multiple languages. The iPhone was either reset or updated to a software version and it must go through setup again. You can also restore it from a backup you made of the same device.